These are intensely flavoured little chocolates in which the coffee taste comes through quite strongly. 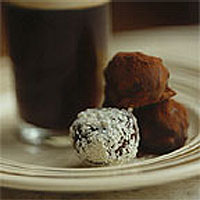 Try making them with a coffee such as mocha sidamo, which has overtones of cocoa. Put the chopped chocolate in a large bowl and set over a pan of just-boiled water to melt. Meanwhile, crush the cardamom seeds as finely as possible in a pestle and mortar. Heat the cream, coffee and sugar in a pan, stirring, until the cream is just boiling. Pass the mixture through a fine sieve (or a sieve lined with muslin or a clean jay cloth), to catch the coffee granules, allowing the cream to fall into the bowl of chocolate. Add the cardamom and stir until all the ingredients are evenly blended. Remove the bowl from the pan. Cover the surface of the chocolate mix directly with plastic wrap. Leave to cool at room temperature for about an hour. If the mixture seems quite liquid, whisk briefly with an electric whisk until it just thickens. If it's already thick, just beat briefly with a wooden spoon until smooth and shiny. Chill until firm enough to handle - about 45 minutes. Meanwhile, line a baking tray with greaseproof paper. Take a heaped teaspoon of truffle mixture and roll into a ball. Place on the baking tray. Continue, using all the mixture. You should make about 22 truffles. It's important that your hands are cold - run them under cold water periodically to cool and clean them. Alternatively, shape the truffles with two teaspoons, which is considerably less messy. Chill the truffles for 30 minutes. Meanwhile, put the chocolate for the covering in a large bowl over a pan of just-boiled water until melted. Remove the bowl from the pan and let the chocolate cool a little. If you want to coat the truffles in grated white chocolate, spread it out on a plate now. Using 2 forks, gently lift each chilled truffle and dip it into the melted chocolate then, before it has set completely, roll in the grated chocolate. Alternatively, just return the dark chocolate-coated truffles to the fridge to set. If you're using the cocoa, sift it on to a large flat plate and roll the set truffles in it. Store in the fridge for up to 4 days, but allow them to stand at room temperature for 20 minutes before serving. These are delicious with after-dinner coffee. This recipe was first published in October 2002.